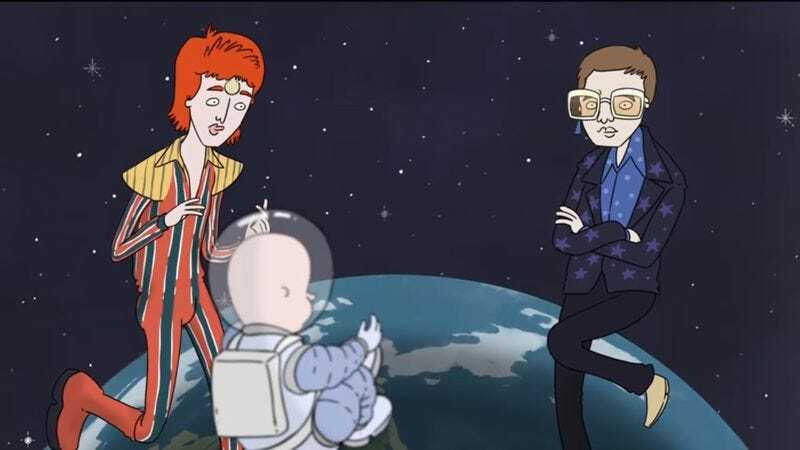 Think of it as an extreme prequel to “Rocket Man” or “Space Oddity.” Singer-songwriter Ryan Maguire’s “Space Baby” tells the story of an infant who explores the galaxy “one star at a time” before he’s even developed object permanence or learned to feed himself. The bouncy, five-minute composition, brought to life via the animation of Greg Doble, provides the origin story of this unlikely intergalactic Odysseus. It seems his father was walking him in the park one ordinary day when he lost control of the baby carriage, which then rolled into a space station and aboard a rocket ship. “You’d think that they’d have security for this sort of thing,” Maguire points out. But no. The helpless babe is launched into the cosmos. Even without parental supervision, let alone food and water, he adapts quite easily to the situation and is soon socializing with all manner of robots and aliens.